I have just upgraded to version 7.5.6. In outline view I have a light yellow background. The problem is the yellow colour is lighter where the outline text is. I want all the background to be the same colour as it was when I was using version 7.2. Any ideas? If you right-click or control-click the background of Outline view in you document, and choose Edit Background…, a panel will open where you can change Color for the background. 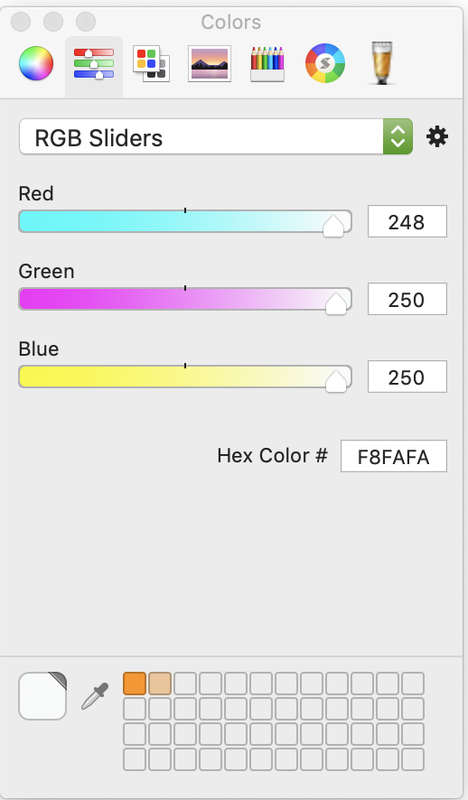 Click the little rectangle to the right of Color and you can open the macOS color picker with different options for modifying your background color. 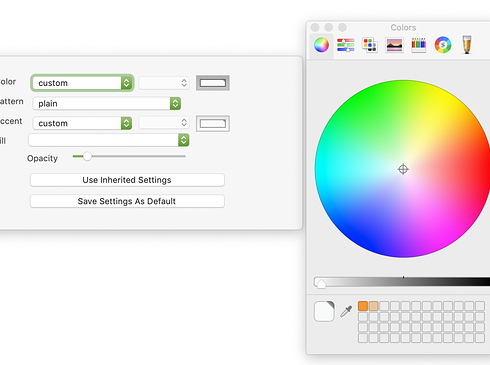 The color tool called “RGB Sliders” is a good one for trying to reproduce a color. That tiny eyedropper at the lower left corner of the tool can be clicked, dragged over a color sample that you like, which will load Color with the same color as your sample. I feel this is probably not precisely the answer, for you, but it might help get you started. The background colour of Map, and other views, is $MapBackgroundColor and its value hasn’t changed since v7.2. The default value is #f2f2e6. I suspect you need to change the $OutlineBackgroundColor to be the same colour as $MapBackgroundColor. b331 (v7.5.5). 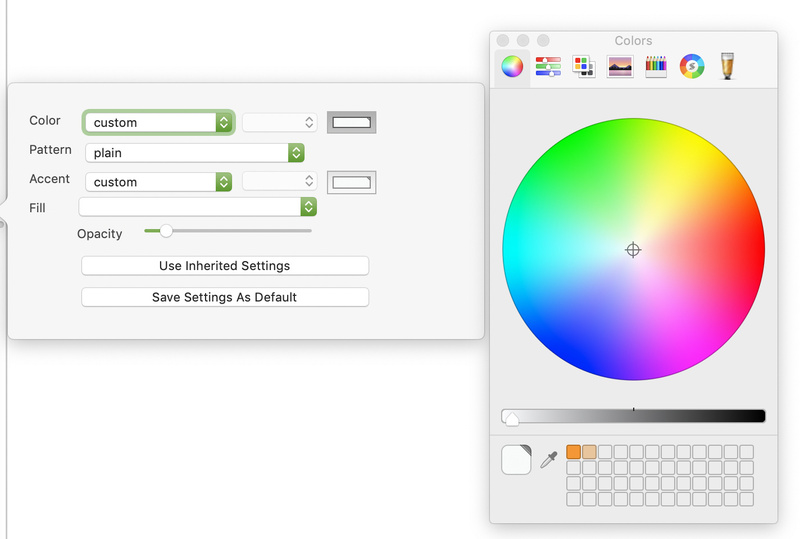 Changes outline highlight, replacing gradient with a very light (2.5%) foreground-color screen. b330 (v7.5.5). 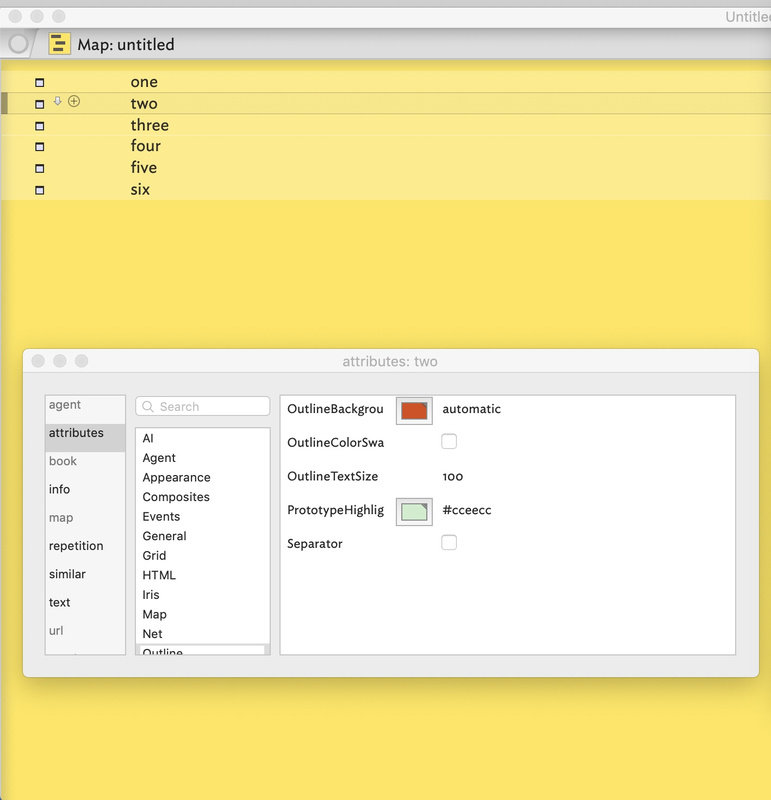 In Outline view, the highlight has been revised to make it easier to identify the highlighted item at a glance. b328 (v7.5.4). Adjusted the appearance of the new selection highlight in outlines. b327 (v7.5.4). In outlines, the selection highlight is emphasized by rules at the sides of the selected note. b322 (v7.5.3). Outlines now use $OutlineBackgroundColor to tint the background behind the note. I wonder if one or more of this are contributory factors. Thank you all for your replies. As Paul suggest I normally change the background in that way. Usually it applies the same colour to the outline and the background. I am not sure what is happening. The Outlinebackgroungcolor is set to automatic. See below. You can see the difference between the two colours. I still have version 7.2 installed and it works fine with this. What Mark says works but to achieve this I have to set the background colour for each entry in the outline separately - a painstaking process. You should be able to set this in a prototype. Thanks. That would be possible, but I would prefer it to function as it used to. I can’t replicate this in the current backstage release; I believe it’s addressed. Thanks. That would be good.